It’s funny how a simple comment can change your life. First, a little background. I’m a middle-aged, post-menopausal woman who still suffers from forgetfulness… I think. I work for The Taber Times, and am an obsessive reader and re-reader who’s gone through two copies of Gone with the Wind, and read the Harry Potter series non-stop for several years. As soon as I finished the series, I started over again. For me, re-reading is like visiting old friends. I puzzle with Sudoku, crosswords and jigsaw. And I’m a movie buff. I have no problem doing a doubleheader (note the sports analogy) at the theatre, and my own collection is kept in disc binders just to keep them manageable. My kids and their families have an open invitation to dinner every Sunday, and here is where my story begins. One of my son-in-laws is a die-hard sports fan. Year round, it’s NFL, NHL, MLB and so on and so on. Now you would think that a Red-Letter day would be engraved in my mind, but I honestly don’t remember which teams were playing. My son-in-law is a die-hard New Orleans Saints fan, so the odds are good they were playing. I was told about offence, defense, touchdowns and field goals. I heard about quarterbacks, wide receivers, tight ends, kickers and punters. I saw blitzes, draws, sacks, touchbacks and trick plays. As the game progressed, I seem to remember thinking I would give football an honest try, meaning I’ll try to promise to watch three games, but I really don’t think this is going to last. And then…seconds left in the game, you know it’s the last play. It’s fourth down with three yards to go for a touchdown. 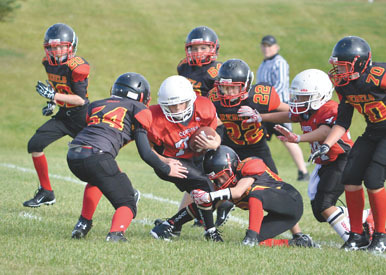 The quarterback gets the ball, and LEAPS over the defensive line – TOUCHDOWN! At that moment, I was a goner. Before I knew it, I was downloading Football 101. And how to find MY team. I don’t care about the colour of the uniform, I’m not riding the Tom Brady train, and it doesn’t matter how close to Alberta they are based. So I picked the Green Bay Packers, because the team is community owned, but I’m not exclusive. I watch any and all games I can, including Army vs. Navy and other college football. I prefer to watch alone, because my yelling disturbs no one, distractions are just that, and disasters can happen when others are in the room, like when my two-year-old grandson shut the power bar off for the TV and cable box, right at the end of a big game and the Saints were on offence, needing the touchdown to win. The big play was in action, and there I stared at a blank screen. Blood-curdling yells and hysteria ensued, and the race was on to the tiny TV in the kitchen. As a result of that race, the child survived, and my husband stayed behind to restart the downed TV. It’s fun to go into work the day after a game and talk to Greg, who is both editor and sports reporter for The Taber Times. I often get the names wrong, the description of the play wrong, even the team name wrong, but Greg never snickers at me, and does explain some of the points I’ve either forgotten or misunderstood. I suspect he laughs hysterically after I leave the room, but that’s OK. I may not remember the details, but at least I remember the big picture… I think. My life now from the beginning of September to Super Bowl Sunday and beyond, is focused on the placement of toes, butter fingers and big hands, interceptions, fumbles, play reviews, injuries, AFC, NFC, conferences, trades, free agents and the draft. I count down to the start of the season, and practically hold a wake at the end of it. As the clock ticks down to the start of the new season, I’m planning my new strategies: 1. Buy a megaphone. I hate to be ignored. 2. Sign up for the NFL channel, I hate to be limited. 3. PVR (record) every game so I can go back and analyze each game. Oh, who am I kidding, With my memory, it’ll be like a ‘whole new season!’ No wake required.